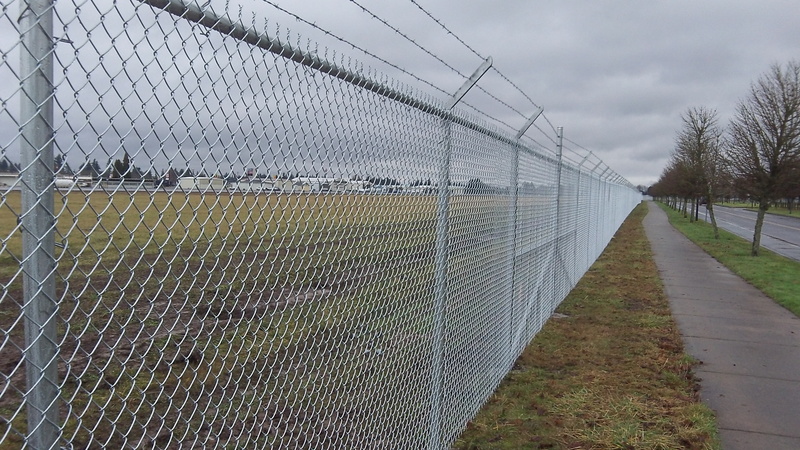 The new fence stretches along Price road on the east side of Albany Airport. Timber Linn Park is to the right. Wasting a quarter-million dollars is one thing. Making the airport property line near Timber Linn Park look like the outer perimeter of a prison is another. The city of Albany has done both now that the new fence along the east side of the municipal airport is mostly completed. When this came up before the city council a few weeks ago. Mayor Sharon Konopa was worried that the fence — seven feet tall with barbed wire on top — would look out of place so close to the park. Now that it’s up, has she changed her mind? Not exactly. “It is horrible in my opinion and extremely unnecessary,” she said in an email. City officials say the federal government required that the airport fencing be made more effective and secure, at least in looks. It gave the city a grant to cover 90 percent of this second and final phase of the fencing project, which is costing $253,000. The city depends on federal grants to maintain and improve its general-aviation field, so when the Federal Aviation Administration says jump, the city administration leaps. This is how the country is being transformed in its system of government, with the central government calling the shots even on something as local as the fencing of a small rural airport. I drive and walk by that fence every day. It is awful. It’s depressing to see actually. Having chased my share of “bad guys” during my 29 years….That fence won’t stop a determined guy. Then I’m stuck on the wrong side with 30 lbs of gear on trying to find a way around it. Fences do make good neighbors but really only keep the good guys in/or out.